Pride 2018 at CJSF starts this week! Here's how we're marking the occasion this year: read on for more info. We will be broadcasting a variety of music and spoken word programming that highlights LGBTQ2S perspectives throughout the week starting July 30. Tune in to 90.1 FM in Metro Vancouver and cjsf.ca worldwide for Pride-focused episodes of your favourite CJSF shows including Speak Up! 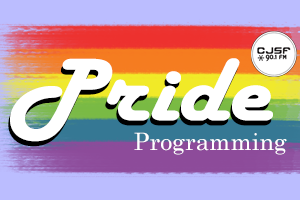 and SFU Ideas and Issues, and enjoy a full day of Pride programming on CJSF from 10am-6pm this Friday, August 3! This year, we will be tabling at the Sunset Beach Party this Sunday, August 5, the day of Vancouver Pride! Join us that day, as well as at the New West Pride Street Party on August 18, for a variety of fun activities: if you're interested in taking part at our Pride tabling events, drop PRCoord Chris a line at cjsfpr@sfu.ca. As always, stay tuned to this website or our social media (@cjsf on Twitter and @cjsfradio on Facebook and Instagram) for more updates!